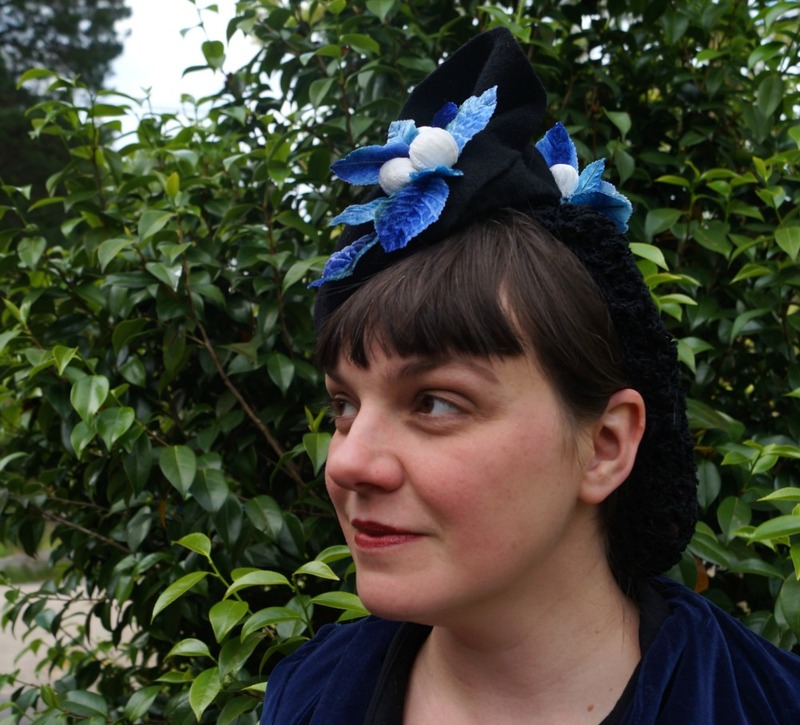 Three years ago I had a newborn baby and I made a felt hat that would travel the world. It was a journey that I expected to take a year, that ended up taking three, when it should have taken two. It's been a year since Adelaide, as we named the hat, came home to me, hand delivered by my sister, who was the last person she visited. At that time I was pregnant, exhausted, not fitting into most of my clothes, and not really feeling like being the subject of photos. I did plan to do it anyway, many times, but I made more and more excuses. Time. Energy. Wardrobe. Body Image. Hair. Heat. Rain. Then T-Rex was born and naturally it became even more difficult to get a photo shoot done, and life was even more exhausting. Plus, after all the wait, I felt I should make it a really good shoot. A really good outfit. A special location. In the end, it wasn't any of those things. But enough was enough! While T-Rex napped, we went outside and my husband took photos of me in front of our deck and a bush in our neighbour's front yard while Teacup played and picked flowers. And it was enough. Of course it was. I should have known. Because I have no hairstyling skills, I decided to try the hat with a snood, and I really like how they look together. 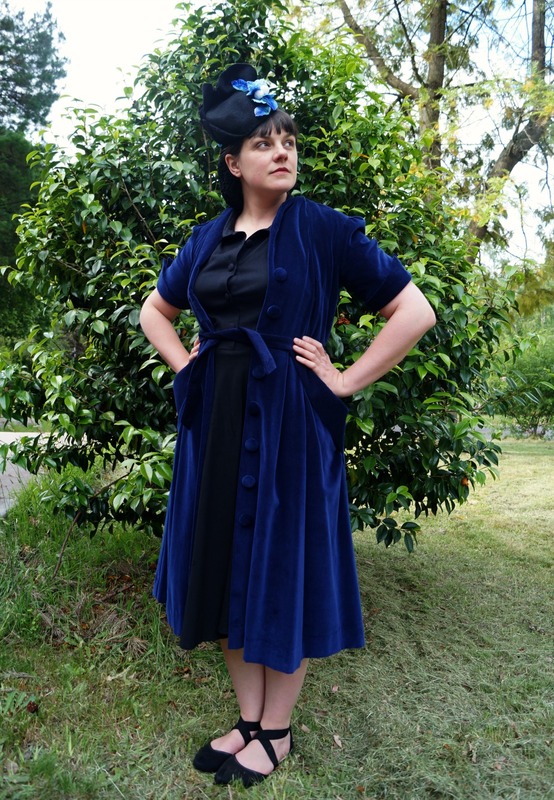 I threw my Evelyn Wood velvet coat/dress over a black shirt dress and there you have it. 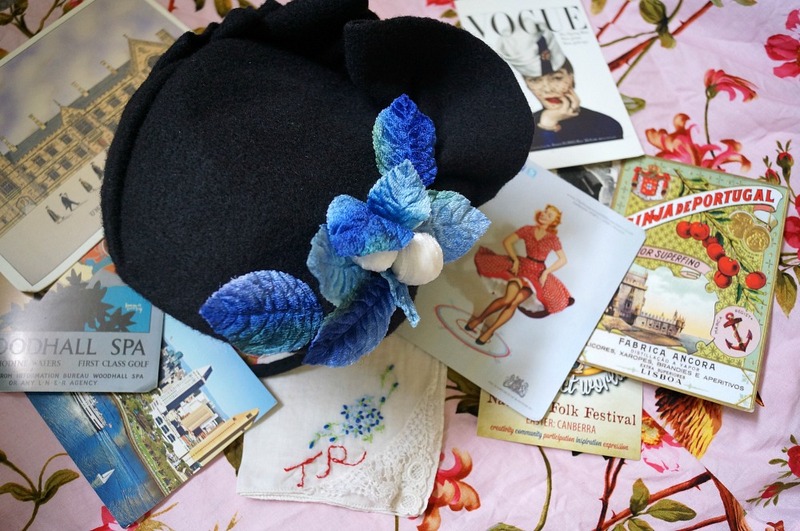 Adelaide came home with many souvenirs, including her decorated hat box. I wasn't sure what I was going to do with her after she came home, but I think I'll have to pack her back up with her treasures and keep her for the future, for my daughter perhaps. I love how Adelaide's journey is one of so many stories. 8 countries, 18 different women. Some of the bloggers who participated are no longer blogging, no longer present in the vintage community. Some have become close online friends, some I have since met in person as well. And the newborn baby who napped while I blocked this felt is now a chatty three-year old, with a baby brother. 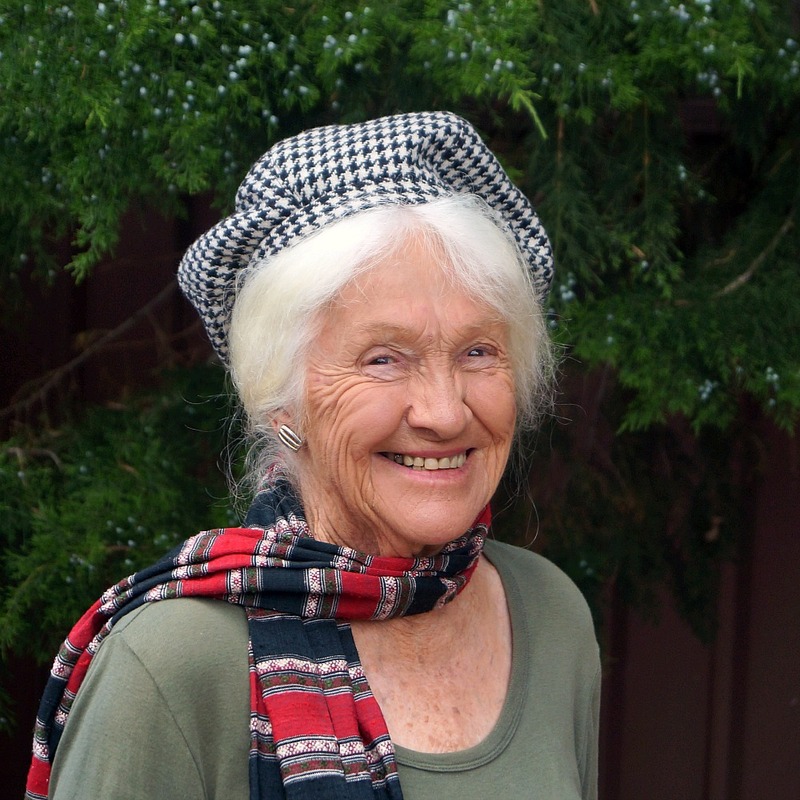 Say hello to the Grevillea beret pattern! 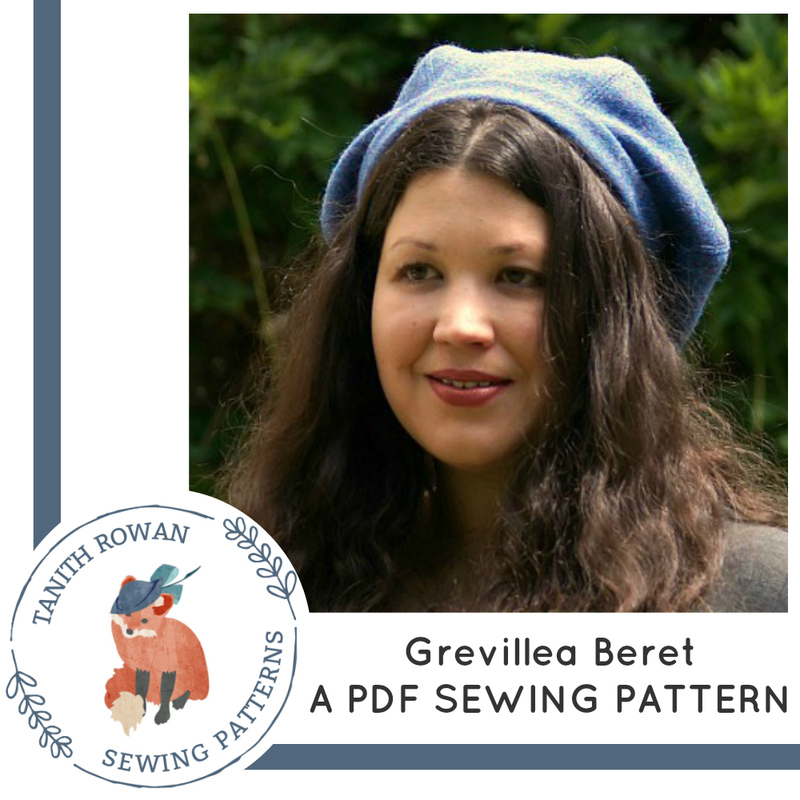 More than a year in the making, my first hat sewing pattern is here, and I'm delighted to finally share the Grevillea Beret with you. 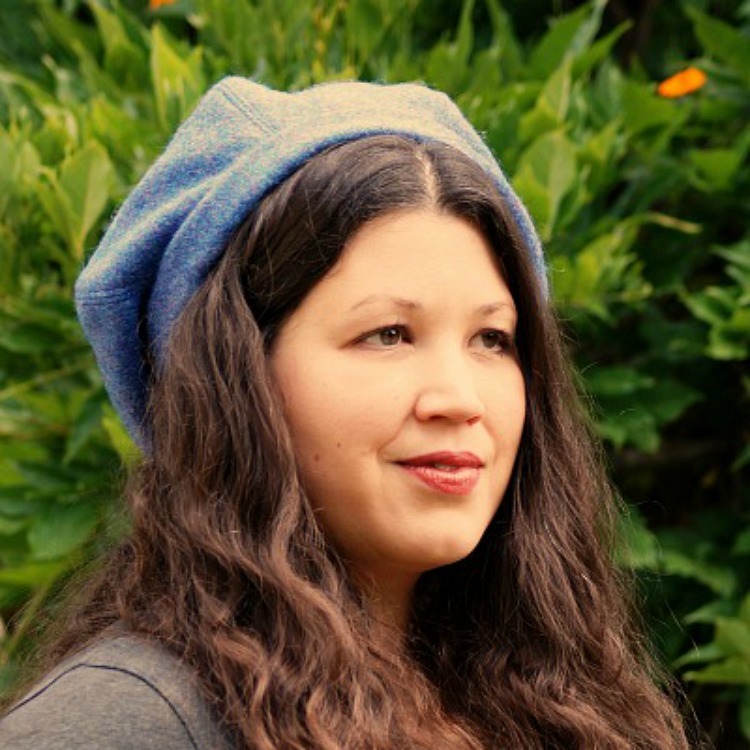 Choosing what the first pattern should be wasn't easy, but when I think of how many berets I've made for myself from this pattern, and how often I wear them when the cool weather rolls around (which is most of the year, to be honest), it was the obvious choice. So, here are the basics about the hat. 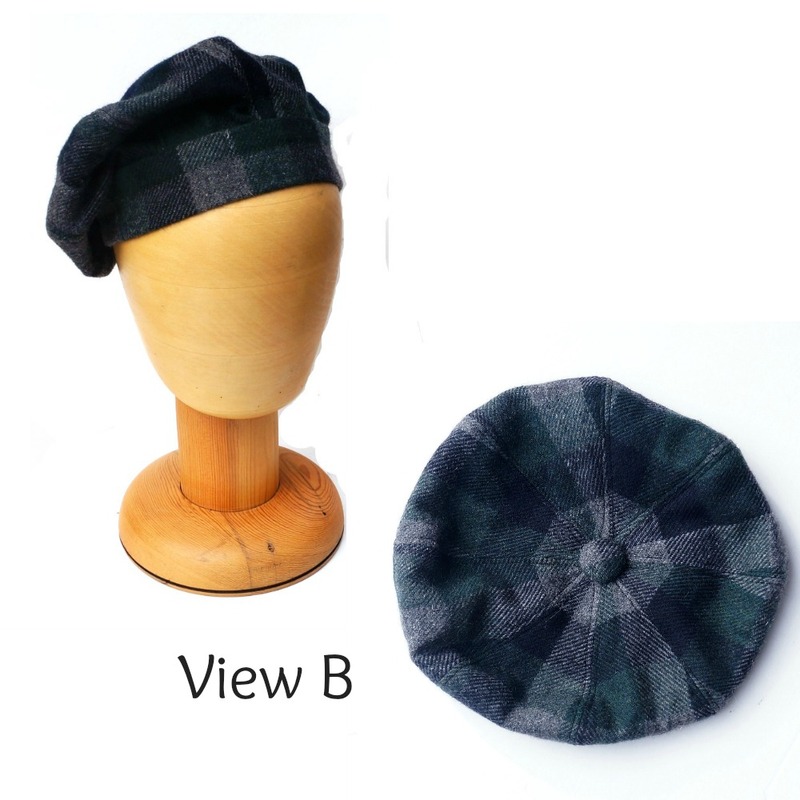 It's a sectioned crown beret, with two views, one with six sections and one with eight, and two widths of side head band. It's great for lovely wools. 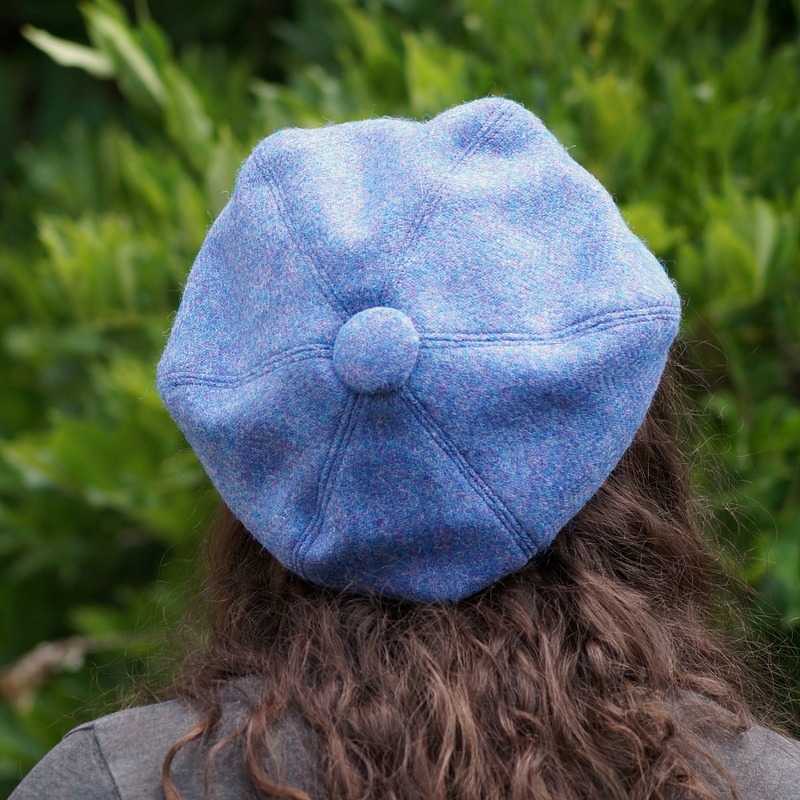 I like to use old jackets and coats sometimes, and in fact my first beret from this pattern was once a much loved red coat. 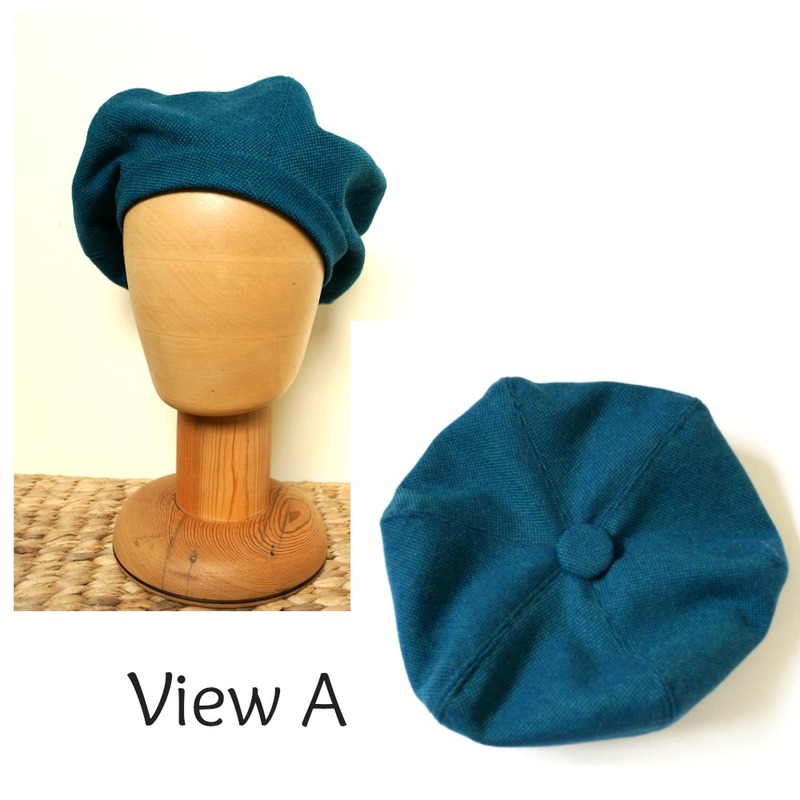 You can wear the beret in a variety of ways; it's really versatile. I'm a fan of wearing mine to the back of the head as shown in most of the images. And I really do wear them. 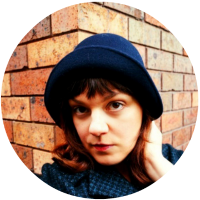 I have three in my wardrobe and I'm making a fourth at the moment, and they are my go-to cool weather hat. The basics about the pattern. It's available at my Etsy shop as a downloadable PDF pattern. You get two PDF files, one is the instructions and one is the pattern. The instructions contain all you need to know about fabrics, sizes, whether to line it, what to do about grain direction, and of course full step-by-step instructions with photos. The pattern file will need to be printed out, at 100% size, and the pieces cut and assembled (where they are larger than one page). The instructions include explaining how to do that if you are new to print-at-home patterns. I'm really excited (and tired and beyond-anything-terrified but let's stay positive) to be launching this pattern into the world and starting out in this new direction. Expect some tips and tricks and bonus tutorials coming up soon! I do have things in motion for the next few patterns but feel free to suggest what you'd like to see in the future. This latest custom creation combines two more new skills (I said I wanted to learn this year, and I'm really doing it!) but I'll have to talk more about each of them another time. 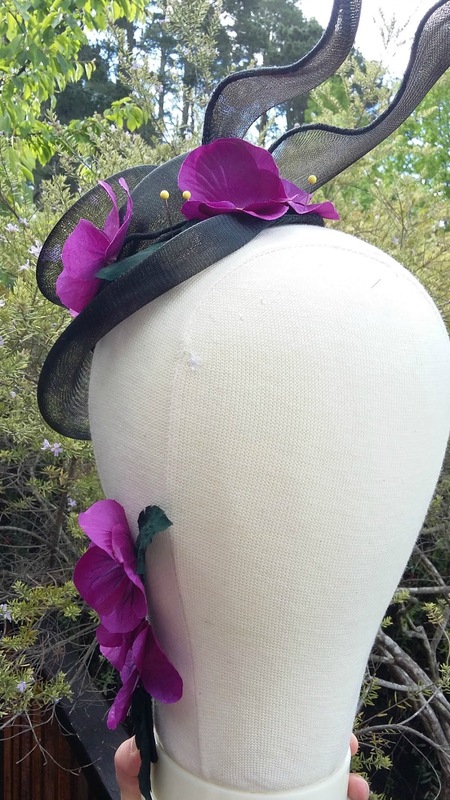 I actually took another online class on working with crinoline, and I have 1.5 finished hats using those techniques, but no photos of the completed one yet. Still, it gave me a lot of confidence with the material, and I used the techniques in a slightly different way to bring this hat to life. I feel like it's a real mix of vintage shape and details but using a less conventional material and realising the project using modern techniques. Definitely an unusual one for me, but I'm really pleased with it! One thing that usually happens when I'm working on custom orders is that I'll get excited and ambitious, and this happened rather a lot here. I sketched flowers in the original design and figured I'd work out the details later. In the end, "the details" became me tackling yet another new skill - French flower making. 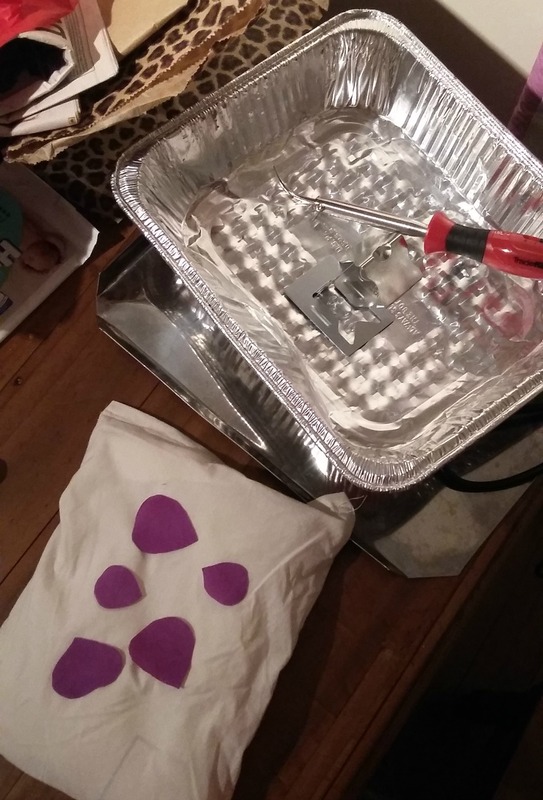 Traditional flower making involves heated tools applied to stiffened fabric (usually silk), and it seemed a bit daunting, but I managed to achieved some creditable results in my self-imposed crash course. The usual beginner flowers are roses, but yet again ambition got the better of me, and I veered off on my own to try pansies. In the end I think they are much easier as the petals are relatively flat and they only have 5 petals each, so I saved myself some time there! It's not an ideal technique for working in tiny pockets of time in the evenings though, so my progress from here may be rather slow, but I know I'll get to it at some point. 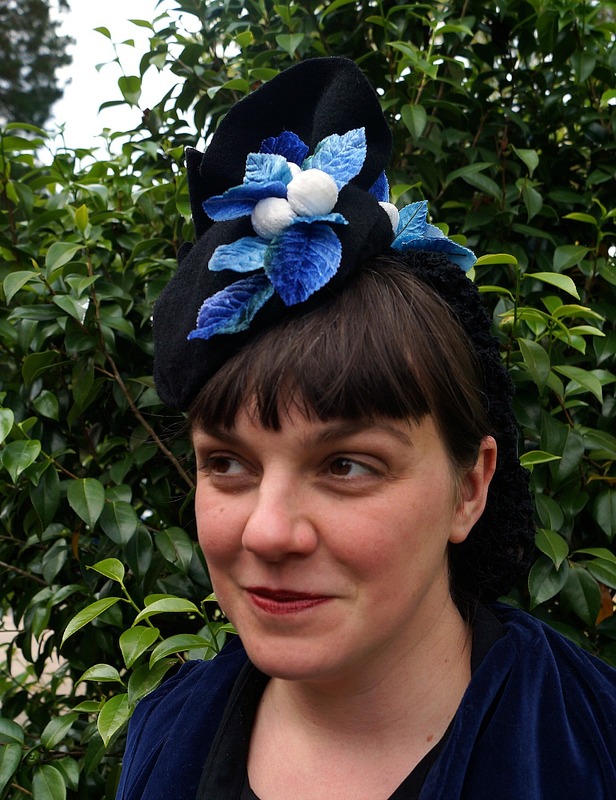 This is the first hat of mine to attend the Melbourne Cup (as far as I know). I had mixed feelings about this and had a little reflect on my ethics. 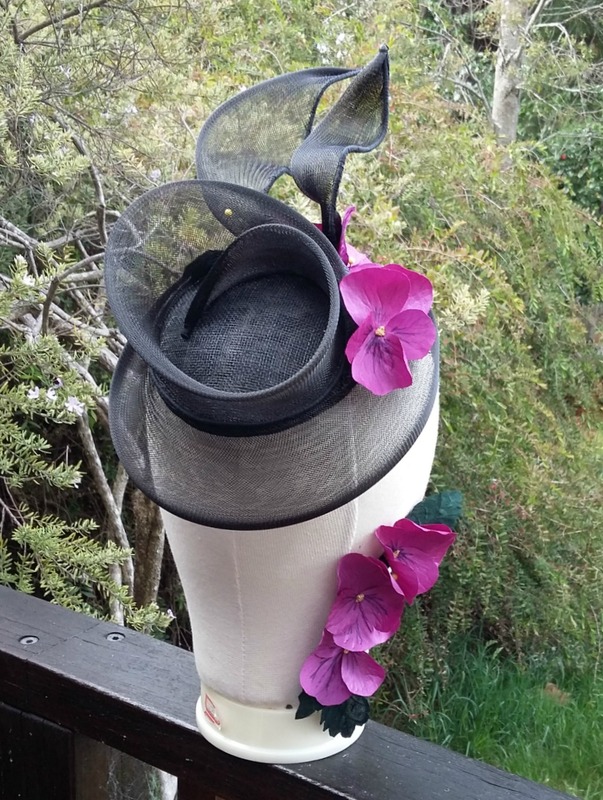 I love hats, and in Australia racing fashion is the primary millinery market and the pinnacle of the art is displayed at Melbourne Cup. 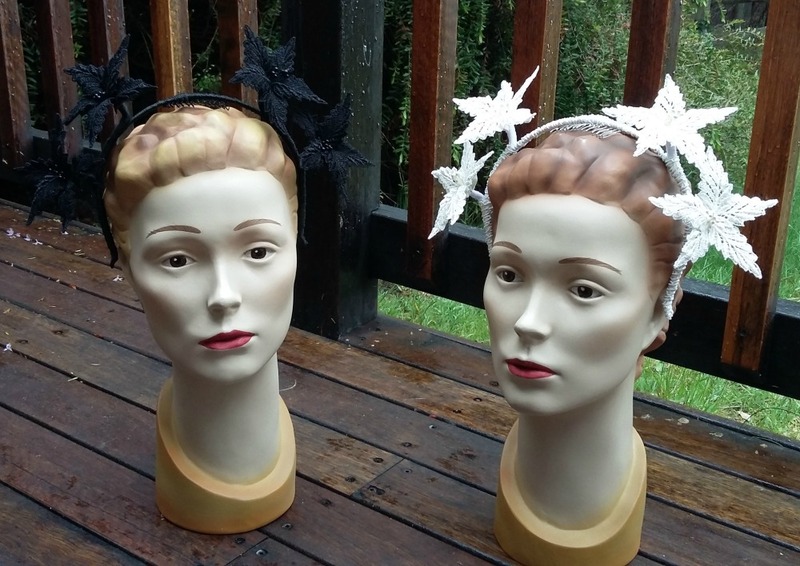 Milliners involved in this field are pushing the boundaries all the time and creating techniques and styles that are beyond stunning and incredibly intricate. It is the most inspiring stuff. Racing, on the other hand, stands for a whole lot that I am not keen on, but primarily the mistreatment of animals. (I'm not crash hot on gambling and binge-drinking either). It's mainly for this reason that I've not chased the racing fashion clients, and I'm glad that I chose not too. I've ended up much happier in my lovely vintage fashion niche anyway. 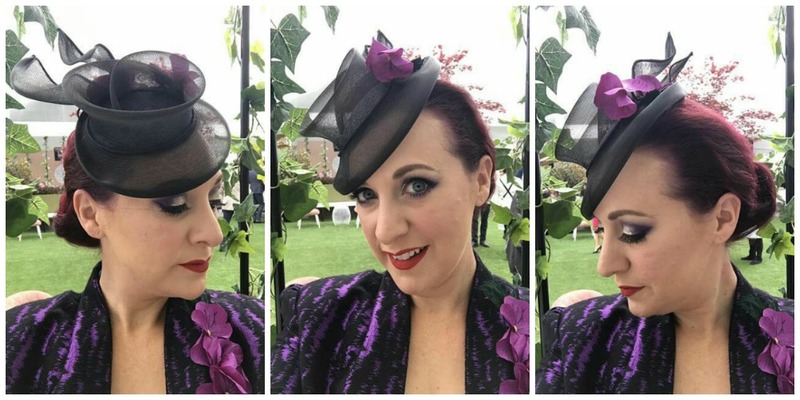 I don't really have a point there, just to say that as much as I am loving learning the newer techniques and making things in different styles, that I won't be changing direction into racing fashion, even though the average person in Australia assumes that it is all any milliners do. 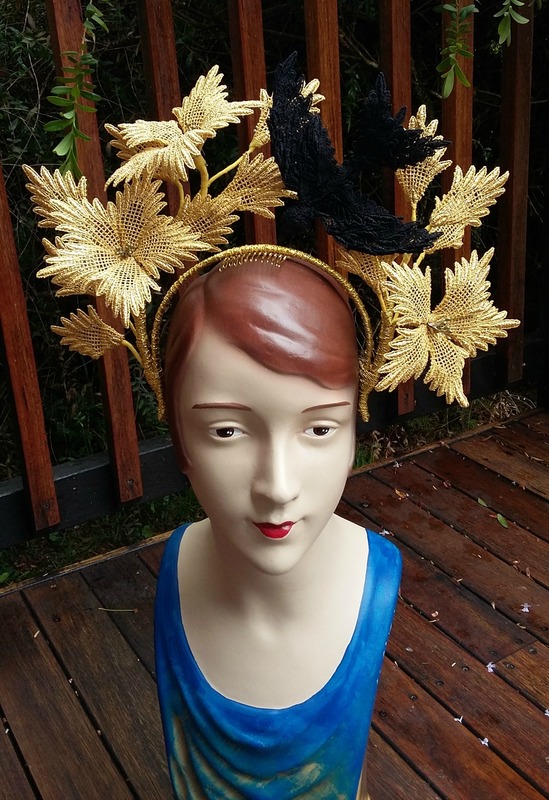 And that I wish there could be some other event that gave every day people a socially-acceptable reason to wear extreme, high-fashion art millinery. That would be cool. P.S. Thanks to Beccie for letting me use her photos in the post. All I had were the other ones with pins still in the hat! 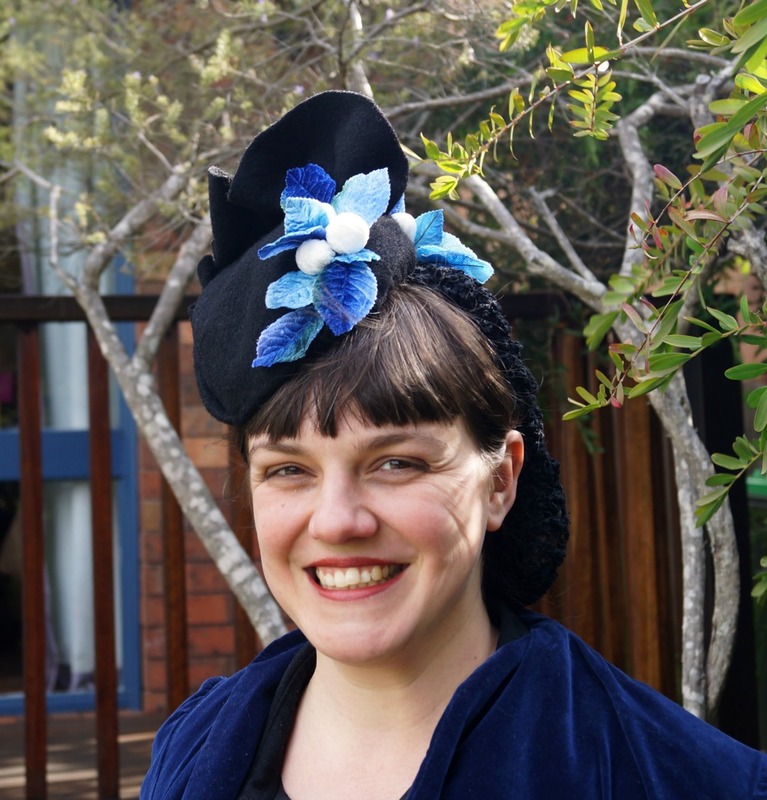 As you may or may not know, as well as selling through Etsy, I have my hats in a local bricks-and-mortar shop, called The Blackheath Hub, which stocks the work of over 100 artisans from the Blue Mountains. They've recently started doing themed exhibitions as well. 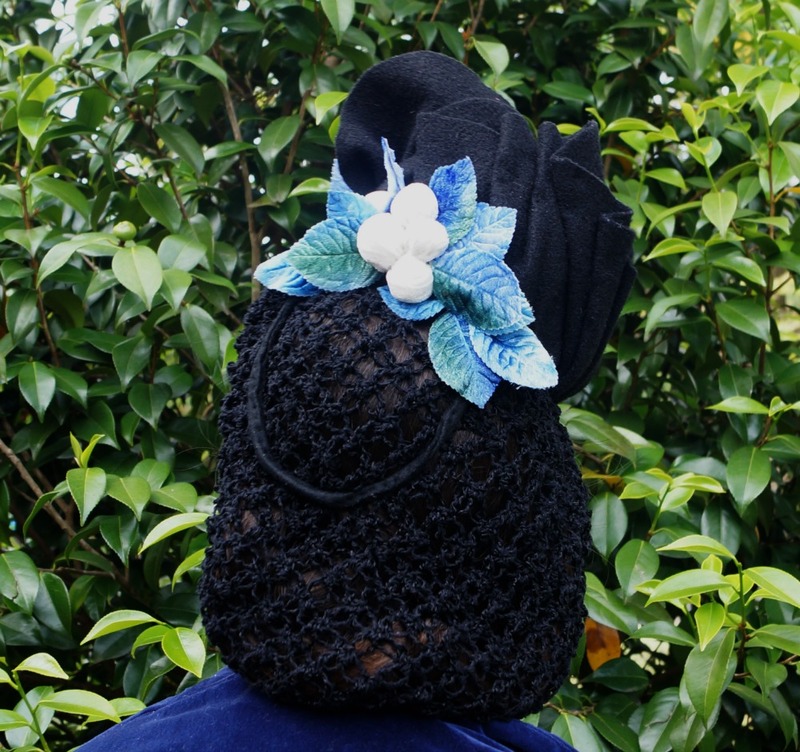 I wouldn't have thought I would have time to contribute, but when I heard the theme was flowers, and I had just finished the my first lace flower headpiece and the lace halo crown, and was starting a few more pieces, I thought I might actually be able to do it! And I did! There were a few late nights at the end, but I completed the remaining three pieces I hoped to make. The fifth was a bit more of a...statement piece. I sketched this in hospital, or perhaps shortly afterwards in my long periods of lying around and drinking coke on doctor's orders, and I've been excited for it ever since. 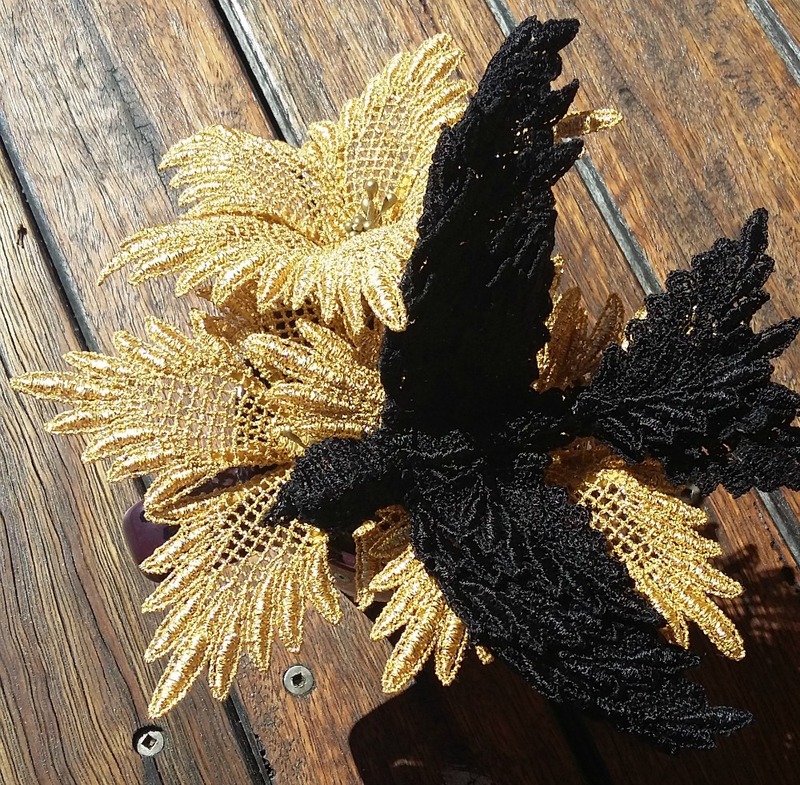 I had long periods of doubt during the making process, particularly when I was making the bird, asked my husband how he thought it looked so far, and he replied "What's it supposed to be?" In the end though, I'm pleased with the result. 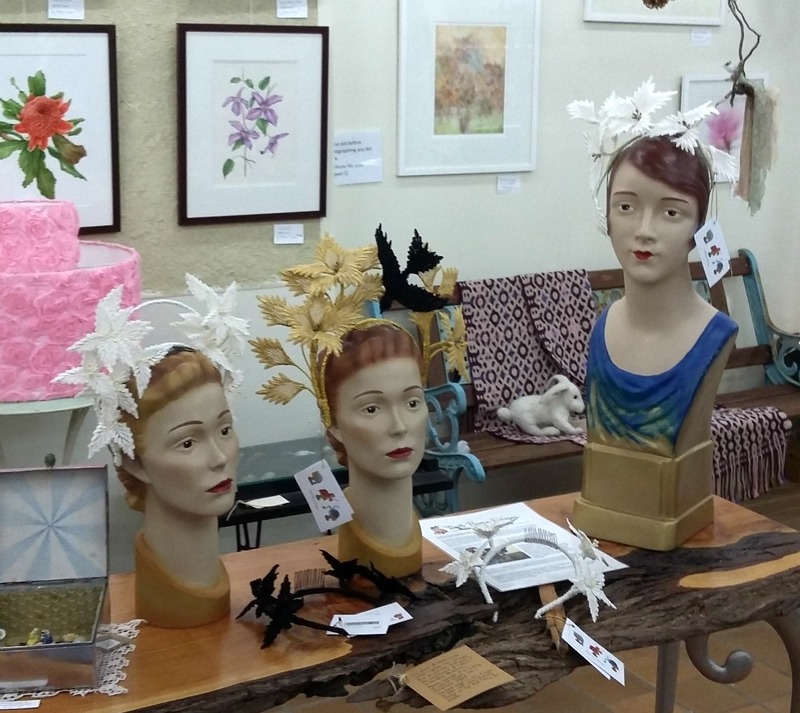 Having heard the next couple of planned themes, I'm keen to participate in more of the Hub's exhibitions. I love a good theme, and although I don't love a deadline, they do help me get things done. I doubt that the gold and black one would actually have gotten done this year, if at all, otherwise, and I'm really proud of it, so the odd deadline must be good for me. Which do you prefer: over-the-top statement piece or delicate (relatively) subtle crown?